Inspector General of Police Kakoma Kanganja is the complainant and star witness in the case where Chilufya Tayali is charged with criminal libel fir saying Kanganja is inefficient and incompetent. Resident magistrate Felix Kaoma presiding. Kakoma Kanganja on stand as state witness for continued cross-examination. Keith Mweemba shows PW1 ID 1 [Tayali’s Facebook Posting) and asks him to read it in court. Mweemba: Are the words in the indictment and in ID 1 the same? Kanganja: They are the same. Mweemba: Witness, check properly, are you sure? Mweemba: In ID 1, is there Hakainde or HH? Kanganja: It is HH, which is the same as Hakainde. Mweemba: You agree with me that HH is not synonymous with Hakainde? Kanganja: Even a small kid is aware. Mweemba: The letters HH do not appear on the indictment? Mweemba: Is it a fact that you’re relying on ID 1 to frame the charge? Kanganja: I’m not because I’m not the author. Mweemba: If you’re not relying on ID 1 to support the charge, then what document are you relying on? Public prosecutor: Objects to the line of questioning saying the witness has already indicated that he is not the author of the indictment. Mweemba: Has your position changed in the evidence you’re relying on? Kanganja: No your honor. I’m relying on the indictment. Mweemba gives the witness another document and asks him to identify it. Mweemba: Who is the author? Mweemba: What is the last name? Keith: What does the first sentence say? Keith: What is the fifth name? Mweemba: What are the initials? Mweemba: You know; just tell us. Mweemba: Is that Hakainde Hichilema? Mweemba: If you look at the indictment, what dates are there? Mweemba: You, in evidence in chief, indicated that as a result of ID 1, people started calling for your resignation? Mweemba: We want to show that it’s not true…(gives him a newspaper). Mweemba: What does the banner headline read? Kanganja: I WILL NOT RESIGN – IG. Mweemba: It is a fact that you uttered those words? Mweemba: It is also a fact that it has nothing to do with ID 1? Kanganja: It was part of that. Mweemba: The indictment date is 13th and the newspaper is 13th? Kanganja: It was part of it. Mweemba: You agree with me that those words in the newspaper were not uttered on 13th April? Keith: Read paragraph 4 of the same article. Mweemba: Read page 4 of the Daily Nation newspaper 11th April. Public Prosecutor objects as the witness is not the author of the content. Mweemba: What is the banner headline on page 1 and 4? Mweemba: What comes first;11th or 13th April? Mweemba: It is a fact that there was no publication of ID 1 on 11th April? Mweemba: Answer the question; we don’t want to keep you long. Kanganja: I can go the whole day. Mweemba: Is it a fact or not? Mweemba: Is there any other statements before ID 1? Mweemba: There were many other people who called for your resignation long before ID1? Mweemba: Other people had done that before the accused did? Kanganja: His was so serious. Mweemba: Obvious by that time the issue of treason was already in public domain. Kanganja: Not to my knowledge. Keith gives Kanganja a statement of 12th April 2017: By then the issue was of public interest? Mweemba quotes the evidence in chief by PW1 “…people are still calling me about it”…what is the “it” referring to? Kanganja: Even now…there are family members in here. Public Prosecutor rises to object saying he does not know what counsel [Mweemba] is trying to achieve. Mweemba: Not articles but an article. Kanganja: The article calling for my resignation. Kanganja: They quoted several sources. Mweemba calls on court for direction. Court reads the evidence in chief. Mweemba: You agree that the article referred to is ID 1? Mweemba: So it is not true that the article in reference is not ID 1 as people had long started calling for your resignation? Kanganja: “If it is proved that the police were unprofessional in the Mongu fracas, then IG Kanganja must be fired or resign. 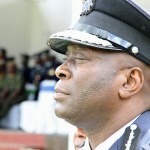 Leading the assault on police, Mumbi Phiri said the unprofessionalism by the police is disappointing”. Mweemba: Mumbi Phiri is describing the police as unprofessional? Kanganja continues quoting the briefing by Mumbi Phiri of 10th April 2017. Kanganja laughs at the statement by Mumbi Phiri that the police were too fat to run. Mweemba: You agree that Mumbi Phiri is telling you to arrest HH and charge him with treason? Mweemba tells court that they are now resorting for audio and video evidence. Mweemba: Mumbi Phiri is directing you to resign or arrest HH and charge him with treason? Kanganja: She was not directing me. Mweemba: She was directing the IG; who is the police IG? Mweemba:The police subsequently arrested and charged HH with treason? Mweemba: A politician of a political party issued you with an instruction? Mweemba: There is a recording between you and press aide to the President, Amos Chanda. Mweemba: Ok…the court runs the Mumbi Phiri audio…. Mweemba: She is categorical that the Mongu saga was as a result of a lapse on the service. Kanganja: That’s not the correct position. Mweemba: The lowering of the presidential car’s window cannot be blamed on HH? Mweemba: So your police allowed that to happen? Kanganja: The police restrained themselves otherwise there would have been mayhem in this country. Public prosecutor objects to the questioning as police are not aware of the automated window. Gilbert Phiri objects and wonders why the public prosecutor is starting to testify. Court: How relevant is the issue of the window? This issue is not necessary. Mweemba: Your honour, we are trying to show that the witness is incompetent as indicated in the indictment. He is in charge of planning and other aspects of security planning. Mulambo Haimbe: Allow the cross-examination to proceed as counsel is trying to lay the foundation. It has also come to our attention that the witness is addressing the court directly. Mweemba: According to your morning briefing, who opened the [presidential vehicle’s] window? Mweemba: Did you bother to ask your officers as to who opened the window? Kanganja: According to state security. Mweemba: Did you ask how the route lining was done? Do not point fingers. Kanganja: But you are also pointing. Mweemba: Yes, because I’m on the floor. Court: Witness, counsel is allowed to do anything so just answer. Mweemba: You allowed the UPND convoy to pass? Kanganja: He was not allowed to be on that road. Mweemba: But the convoy passed? Kanganja: There was arrogance in that convoy. Mweemba: How did you know that he was not allowed? Mweemba: And the operation order was availed to you? Mweemba: Are you the one that told commissioner Lungu that HH should not be on the road? Mweemba: Where is this operation order today? Kanganja: If the court wishes, it can be made available. Mweemba: Mr Amos Chanda…you know him right? Mweemba: How do you know him? Kanganja: He is the press aide to the President. Mweemba: Shows a statement from Amos Chanda to the witness dated 9th April 2017. Mweemba asks him to read it. Kanganja reads the Daily Nation newspaper of 9th April 2017 quoting Amos Chanda…and Monday 10th April 2017…Headline HH BLOCKS PRESIDENTIAL MOTORCADE. Mweemba: So from Mr Chanda, there is no doubt that the UPND were allowed? Mweemba: You have up to this day not issued any statement to dispel the statement by Chanda? Mweemba: So from that we can see that the UPND were allowed to be on the road? Mweemba: Meaning you should not have allowed the President to be on the road? Kanganja: The President takes precedence. Public prosecutor: I can’t figure out. Mweemba: Since you allowed him to be on the road, there was no need for the President to wait? Mweemba: What is your authority? Kanganja: It is security protocol and standards order. Mweemba: Meaning you acted outside the law? Kanganja: It is within the law. Mweemba: Chanda said the President’s life was not in danger. Mweemba: You provide briefing to the President on daily basis? Mweemba: Himself said he was not in danger. Court: Counsel seems to be going into matters of treason, which is not the case before this court. Mweemba: The President says his life was not in danger…he was in Western Province and you were not? Mweemba: Meaning the issue of his life being in danger is best known by him not you? Court runs the recording of a chat between Amos Chanda and Kanganja. Mweemba gives witness Daily Nation of 15th April 2017…POLICE PROBE KANGANJA PRIVATE RECORDING. Kanganja reads the content. Mweemba: The recording and the statement from your spokesperson is the same incident, not so? Mweemba: And you are that person in the audio? Kanganja: It’s not me hence the investigation. Kanganja: It’s not true and that is malicious actually. Mweemba: At that time there was the arrest of Mr Geoffrey Mwamba. Gilbert Phiri rises to complain: I thought this would end but there is consistent mouthing from the prosecution to the witness. Mweemba: Your investigation is centered on who recorded and not the people speaking? Kanganja: It’s the origin of the recording. Mweemba: You will read again. Kanganja: I have already answered and I’m not going to read again. Phiri: Is the witness refusing to answer the question? Court: Can you answer the question! Mweemba: The word purported is not appearing in that statement? Kanganja: Those are the words of the spokeswoman and not me. Mweemba: Your spokesperson speaks with your authority? Kanganja: Not with my authority. Mweemba: Good. Are you aware that the spokesperson had a press briefing on that day? Kanganja : I’m not aware. Mweemba: I’m talking about inefficiency and the witness is not aware that his spokesperson had a briefing. Mweemba: In this recording, you arrested Mr Bwalya Mwamba and refused to grant him bond despite it being a misdemeanor and kept him over a long weekend? Kanganja: Court doesn’t work over the weekend. Mweemba: It is a fact that the arrest of GBM is in line with going for the President’s throat…the IG in the recording agrees that it is not a police service but force. Mweemba: IG, before you was a lady, not so? Mweemba: So those facts tally with what is in the recording? Court plays the audio of Amos Chanda again. Mweemba: You speak to Mr Chanda regularly? Kanganja: No, I don’t because I don’t report to him. Mweemba: You are familiar with his voice? Mweemba: But you’re familiar with your voice? Kanganja : No, I’m not because right now I have a cough. Mweemba: You are not aware that your spokesperson addressed the briefing? Mweemba: That means she addresses the nation without your knowledge? Kanganja: She lets me know. Mweemba: It means that things can be done behind your back? Kanganja: It is not possible. Mweemba: If that is proven, then it will show your incompetence, not so? Kanganja: It can’t because it does not happen. Mweemba: The police is not authorised to carry out orders from political forces? Mweemba: The voice of the IG in the recording says it was their plan to keep GBM in custody over the long weekend. Cross examination is expected could not continue the following day as Kanganja went AWOL.